Lomo's new La Sardina range comes in four designs. Lomographers have a new camera at their disposal. 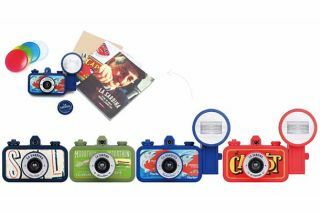 Lomography today announced the launch of its new pocket-size, super-wideangle Lomo camera, La Sardina. Its design inspired by a can of sardines, La Sardina features a 22mm wideangle lens and uses 35mm film. Also introduced with La Sardina is Lomo's most powerful flash to date, featuring three flash power settings to allow for shooting in low-light conditions. Lomo's La Sardina comes in four designs (with 1000 more to come, Lomography claims): the bright red El Capitan, blue and red Fischer's Fritze, the green Marathon and navy blue Sea Pride. El Capitan and Fischer's Fritze both come equipeed with the new Lomo flash, while Marathon and Sea Pride do not. El Capitan and Fischer's Fritze also come pacakged with yellow, red and blue filters.